The global demand for power lawn and garden equipment is expected to grow 2.5% per year, reaching $24.2 billion in 2021. Battery-powered equipment sales are out-pacing other options in every part of the world, thanks to its greater power levels and run times. For consumers and construction companies of all sizes, the outdoor power equipment they choose plays a crucial role in their project success. They have to rely on equipment that is dependable, high-quality, and safe – and they look for a proven approval mark they trust. CSA Group offers the testing and certification services you need to make sure your outdoor power equipment meets local requirements that open doors to markets all over the world. Our extensive services include certification for both North American and global markets, as well as functional safety services and battery pack testing – through testing labs in multiple locations worldwide. Breadth of services: We test against CSA and CB Scheme key standards, and can help you with a wide variety of testing, inspection, and certification needs. We are accredited by organizations such as SCC and OSHA. Delivering unrivaled efficiency and quality in testing outdoor power equipment. The size of outdoor projects varies, but the expectations of power equipment is consistent the world over: safety, quality and reliability. Trust the experts known for quality and innovation. Give your gas-powered tools the testing required to earn the CSA Group mark, and to enter global markets where it’s recognized and trusted. CSA Group offers highly specialized testing and certification services required to ensure that mowers and other lawn equipment gain the market access you need. CSA Group can test and certify* your pressure washers, as well as simplify the process with unmatched expertise, customer service, and prompt communication. Ensure that your chainsaws have the testing and certification* they need to meet the safety requirements of each local market you’re looking to reach. Portable, lightweight, and more versatile, the use of lithium-ion battery-powered tools is taking off globally. Their advantages are numerous, but the inherent safety risks associated with lithium-ion batteries can be challenging for manufacturers to mitigate. Understanding major national and international standards for these tools can help you ensure safety and compete globally. Get the standards you need to gain access to the right market for your equipment. Different markets around the world have different standards and requirements. CSA Group will help you find the correct standards to get your outdoor power equipment tested, certified, and ready for usage. The key standards we test against include CSA and UL as well as IEC-based standards. We offer expert services and custom solutions that help speed your product to market while ensuring compliance and safety. 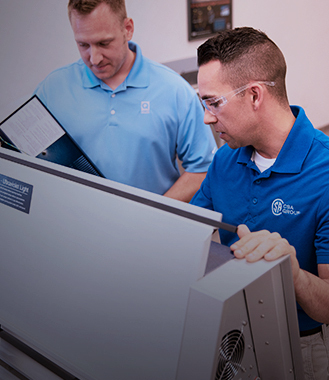 Transform your innovations into quality products that meet critical requirements with our expert testing services. Quickly launch new products, and boost customer confidence in North America and beyond with the trusted CSA Group mark. Get the marks you need to access and enter your target market in North America with confidence. Demonstrate your commitment to product safety even when certification is not a viable option with a one-time quick and efficient field evaluation. Save time and gain efficiencies with access to our customer portal, certified products listings, and more.